Which brings us to Christpher Wool. This fine example of Wool’s language-based painting is now on view at MoMA as part of their current refresh of the Contemporary Galleries, and its visual impact is akin to that of a New York Post headline: graphic, sensational, and not overly predisposed to subtlety. Wool appropriates this evocative line from the film, shortens it like a text message, and then stencils it imperfectly in pump-em-full-of-lead-black on a stark white background. 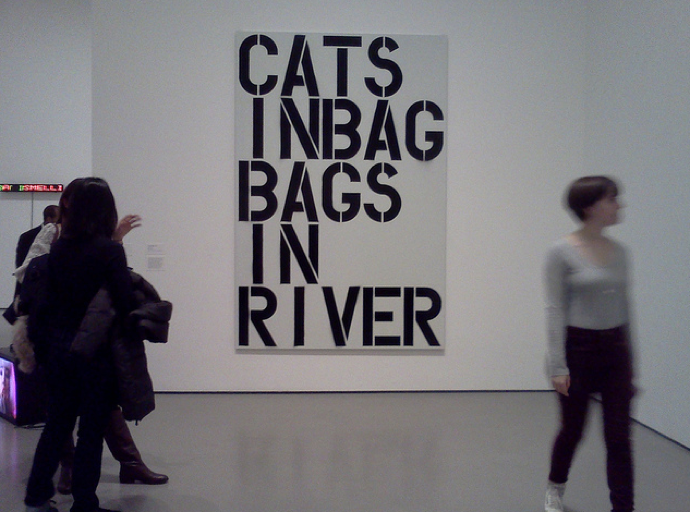 CATS INBAG BAGS IN RIVER suddenly morphs into a puckish haiku, a expression of hardnosed lyricism. Sidney Falco, the character who utters this juicy bit of repartee in the film, is someone that we come to admire for his gumption in doing away with the competition, and his cockiness has a comic edge. This painting too, manifests a certain biting humor, a humor that mocks the seriousness of painting and pays tribute to all of the sinister smart guys in the room—of which Christopher Wool is one. Here’s Mr. Falco himself, aka Tony Curtis, delivering the line full of piss, vinegar and snarling ambition. Don’t be a two-time loser: see this classic if you haven’t already, and then check out this painting in person.